Profit booking dents market. Following the positive global cues, the Indian stock markets closed marginally higher led by IT stocks Infosys and TCS. Mumbai: Following the positive global cues, the Indian stock markets closed marginally higher led by IT stocks Infosys and TCS. Though, the markets opened bullish, but failed to hold on to its gain after the business survey revealing that the manufacturing activity was down in September. 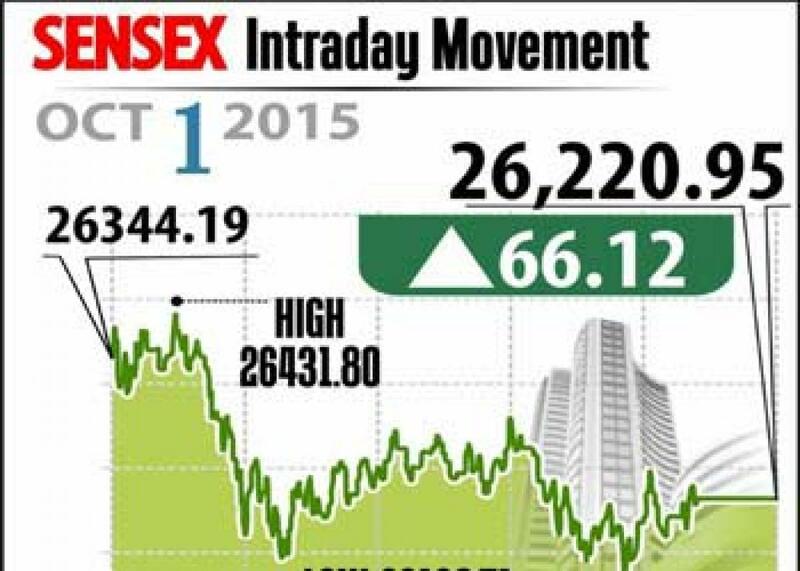 Sensex closed higher by 66 points at 26,220 and Nifty gained just 2 points at 7,950. Meanwhile, the broader markets fared on par with benchmarks as midcap and smallcap indices gained about 0.2 per cent each. Analysts say that Nifty is slowly forming bullish pattern on daily basis and close above 7980 level and current upward move, as it had briefly about 8,000 mark and retraced to 7,950. Further, according to a business survey, the Indian manufacturing activity slowed more than expected to a seven-month low in September as the demand and output softened, which impacted adversely the investor sentiment. On the sectoral front, the rate sensitive sectors like banks, auto and realty going through selling pressure and closed lower between 0.2 - 1.5 per cent. Healthcare and capital goods indices record higher closing at 1 to 2 per cent each. From pharma pack, Lupin, Sun Pharma, Dr Reddy's, Cadila and Aurobindo gained up to 4 per cent each. L&T gained 1 per cent, while the company bags power T&D orders amounting Rs 1,376 crore. On the other hand BHEL, GAIL, Maruti, Vedanta etc down between 1 to 3 per cent each. The gainers: Lupin, up 3.62 per cent at Rs 2,107.05; Sun Pharma, up 2.57 per cent at Rs 890.75; TCS, up 2.01 per cent at Rs 2,639.70; Dr Reddy's Lab, up 1.80 per cent at Rs 4,230.05; and L&T, up 1.54 per cent at Rs 1,489.30. The losers: BHEL, down 2.85 per cent at Rs 199.70; Gail, down 2.60 per cent at Rs 294.25; Maruti Suzuki, down 2.33 per cent at Rs 4,579.85; Vedanta, down 1.82 per cent at Rs 83.55; and HDFC, down 1.15 per cent at Rs 1,199.25. The markets will remain closed on Friday on account of Gandhi Jayanti.